I came downstairs this morning and found a surprise waiting for me. 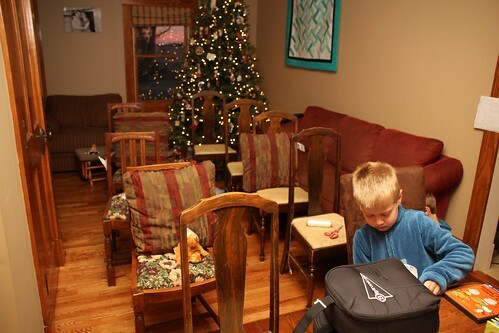 Chairs from all over had been gathered up and arranged in rows, airline style. Taped to the wall was a “food court” sign. At the front was a picture of an airplane, decked out with the Amtrak logo of all things, and a timetable taped to our dining room table. Jacob soon got out string to be seatbelts, too. 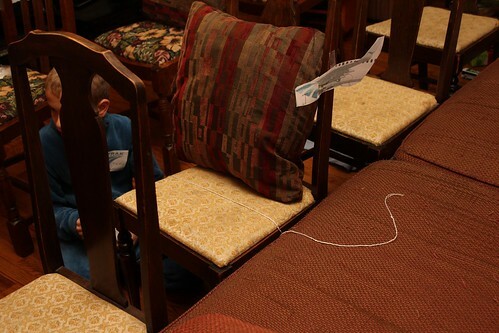 And, using his copy machine, printed out a picture of a wing to tape to the side of the “airplane”. This plane was, according to the boys, scheduled to leave at 9:30. It left a fashionable 2 hours late or so. They told me I would be the pilot, and had me find headphones to be my “headset”. (I didn’t wear my real headset on the grounds that then I wouldn’t be able to hear them.) Jacob decided he would be a flight attendant, his grandma would be the co-pilot, and Oliver would be the food court worker. The food court somehow seemed to travel with the plane. 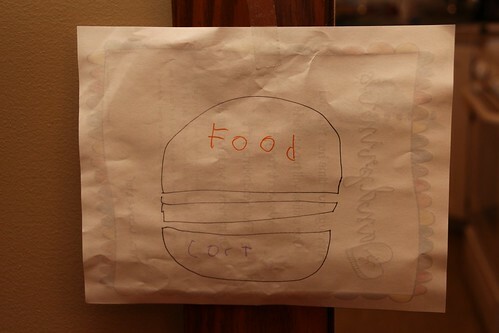 Oliver made up a menu for the food court. It consisted of, and I quote: “trail mix, banana, trail mix, half banana, trail mix, trail mix, trail mix”. He’s already got the limited selection of airport food down pat, I can see. Jacob said the flight would be from Chicago to Los Angeles, and so it was. Since it was Amtrak Airlines, we were supposed to pretend to fly over the train tracks the whole way. If it’s not Christmas yet, we just invent some fun, eh? Pretty clever. I love hearing about what you and your boys are doing. My kids are a little younger and I try to grab inspiration from your adventures.